Return to Scooba, Mississippi to see how the 2016 season goes for the EMCC Lions - one of the most dominate junior college football teams of the last decade. New players struggle to prove themselves both on and off the field for a chance to return to the top levels of NCAA football. The program staff grapple with making change in their own lives. The second season covers the 2016 season, and deals with the consequences of the brawl that ended the 2015 season as well as the impact the documentary has had on the lives and choices of the people in the program. De’Andre Johnson (QB): Dismissed by the Florida State Seminoles for misdemeanor battery after striking a woman at a bar. Dakota Allen (LB): Dismissed by the Texas Tech Red Raiders for his role during a felony burglary of a habitation. Kam Carter (DT): Dismissed by the Penn State Nittany Lions for an unspecified violation of team rules. Chauncey Rivers (DL): Dismissed by the Georgia Bulldogs after an arrest for marijuana possession. 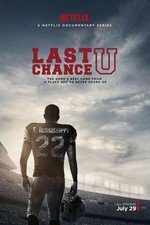 I found this season harder to watch than the first, and it took me a while to figure out why - it wasn't because the student athletes had more serious problems (assault, etc) than the group in S1; it was that what I picked up on this season was the fact that there appear to be a lot of mental health issues and potential learning disabilities in the kids that just aren't being addressed. Kam is the obvious example of that, but there was a lot of stuff going on for Isiah Wright as well and I just felt like - for all her empathy and skill - Brittany can't dig deep enough to get to that stuff. If the interest of the program went beyond these kids as football players - if the interest was in developing them as people (which the coaching staff all believe football does inherently) - then it would need some better mental health and assessment resources. The kids need more off the field coaching then they get, is what I was left with, and the only reason they get anything at all is because they can play football. Watching Buddy's struggles with changing his approach and demeanor was fascinating. I feel like by the end, nothing has really changed for him, as demonstrated by the relatively open mocking the players are doing by the end of the season. To see that Marcus Wood - who seemed the closest thing Buddy had to a friend on the staff - has left his coaching duties speaks pretty loudly to me, as does the fact that Brittany left at the end of the year too. Brittany and Buddy never have a scene together in the entire season, and I think S1 was the same. Isiah...man, I feel for you, but you need to get your head on a bit straighter. Great athlete, lots of emotional stuff this year, but his inability to take instruction and make meaningful decisions was really difficult. I honestly don't know how I feel in the end about De'Andre Johnson. It's sounding like the documentary might be done with Scooba and EMCC and moving on to Independence Community College for next season. Which I'm ok with; I'm not sure I could stand another season of Buddy yelling and cursing, but I'm also going to miss seeing what happens to the program with Brittany gone. It's kinda rare to see the subjects of a documentary reflect that they are in a documentary to the extent that they did (and the film-makers to show it). Buddy was obvious not happy by how he was seen in the first series and sort of attempts to change. But his deep down attitudes seem fixed for now. I liked the scenes with his ailing father and would have liked to have seen more on his childhood and how his sports career went. Kam seems a classic case of having progressed through the educational system without his problems ever being really addressed properly, like a lot of the players - it doesn't help that his personality and attitude is very off putting. I imagine that people have tried in the past but, as in with the defensive line coach here, eventually give up on him and let him do his thing until he's out of their hands.